A question came up on the internet today that I thought was interesting. So I created the diagram below to show silver flutists how to transform their flutes into bamboo sound effect instruments for an easy switch and easy prep. Feel free to try it, and comment as well you enjoy this easy idea. I had success in transforming my silver flute into a bamboo flute by applying a simple piece of masking tape to the embouchure hole of the flute. The original idea was a "flute mute" from Sheridon Stokes, but when placed at a predetermined angle the masking tape also produces a bamboo flute sound effect. Short experiments at home, done with 2-3 inch pieces of masking tape, are quick to accomplish. Just place the tape on the right side of the blow hole, slanted at various angles, unitl you find the sound you want. You can try covering more or less of the far splitting edge if the sound becomes too muffled, and correct the angle to get the sound and pitch. When I found, by experimentation, the exact angle for good bamboo flute sound (I was matching it to a bamboo flute original soundtrack of the piece) I took a permanent fine tipped marker, and drew the placement in dotted lines on the masking tape. I made three of these bamboo sound-effect masking-mute-tapes, and kept them stuck to a label-backing-wax-paper and kept it on my stand. They fit in the zipped side of my case cover after use. It does take several bars of music to apply to the lip-plate, matching the drawing in ink to the underlying blow hole right edge and of course the part has to be re-written in C, but compared to buying actual bamboo flutes and learning to place the correct finger spacing would have taken 20 times longer. The only quick-practice is learning to put on the masking tape piece during short bars rest and pushing in the headjoint as a two-step process. It helps to use a tuner to mark the "push in" line on the headjoint tenon itself. One pre-prepared extra headjoint, provided it could be sufficiently pushed in to match pitch would be another good way to do the switches easily. which is found half way down the page at the above link. If I find a source for viable bamboo flutes in all keys for quick switching for shows like this, I'll add it to this blog post later. Meanwhile, breathe easily (not wheezily). This solution really works. NOTE: Terrific information from a flutist who has played the Miss Saigon show and used bamboo flutes. Reprinted with author's permission. Thank you! I just played this wonderful show in August. The company provided three Bansuri, but I purchased two of my own Dizi (one in G and one in C). 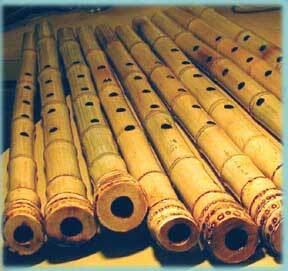 I ended up using 2 Bansuri (keys of Ab and F) and my two Dizi. There is one cue that is not transposed and you have to decide which flute to play, with adjustments. Keep in mind that if you purchase, the designated key is with the left hand fingers closed, not the lowest note. So, if you want the lowest note to be D, then you'll want to order a G flute. The designated keys in the book are the lowest notes on the flutes. You really cannot use just one bamboo flute. This would result in having to use awkward crossed fingerings and poor intonation. The range is also something to consider. I'll be happy to email you a cue sheet if you would like. I can let you know which flutes I played for which numbers. The part was a blast to play, but required lots of endurance. There is a big switch at the end with lots of high piccolo, followed closely by the most exposed flute solo of the piece. There are a few real exposed bamboo solos; most in the first act. Act 2 just has one bamboo cue. Yes, you could play alto flute, but you are not going to get all those cool slides in. You'll also lose out in the colors the bamboos provide. I thoroughly enjoyed playing the Bamboo flutes and was glad to have had the experience. Please feel free to email me privately and I'll be glad to provide you with more information. It's an interesting notion, but as a classical player who made the switch to traditional instruments (I play a wooden Rudall-Rose copy) I have to say there is such joy in getting in touch with your inner wooden flutist! :) I am not sure about reliable bamboo flutes per se (what I play is blackwood) and this sounds like a great idea if you're stuck, but gosh, there ARE instruments out there that play in tune and are a joy to play. :) Just saying! Thanks for that input. Of course a silver flute with tape stuck to it will never be as wonderful as a wooden flute. But when you have a symphony program of some technical difficulty with hours of practicing ahead of you, and only 20 bars of wooden flute in the middle, sometimes solutions like this can help in the 8 days before the concert, when the music finally arrives. Eeek. Do you notice the "eek" factor in what I'm describing? Yes, it's a bit of an emergency fix. I have bamboo flutes by various makers, but I have become particularly enamored of these PVC instruments. They have been used to replace bamboo flutes on Broadway in "Tarzan" and "The Lion King." I find them to be spot-on in tune and more even in tone than my bamboo flutes--plus they are cheap and require zero maintenance. And I dare you to tell which is which without looking! Ahhhh......just the information folks are looking for. Thanks so much Bret. Oh, absolutely, this is a neat idea (even without the eek factor for motivation!). They'll let you try it out and send it back if you don't like it, which is pretty great. I haven't ever bought from him though! Thanks so much for the bamboo flute links for the $60 flutes. Wonderful. And thanks too for saying you love the blog. Wow. I'm so happy to hear that folk are enjoying my ideas. is a very reasonable $64.90 (USD + shipping TBD) for the set of 13 flutes. That's only about $5 per flute! Tipple's pvc flutes are good, but if anyone is really looking for good-to-professional grade bansuri bamboo flutes look up Kirti Shah and One-world-trading. He is an amazing source and very helpful and personable, too. I know this post is over a year old, but I came across it in a search and thought it was simply amazing! After reading all the other great comments I just wanted to share the following for anyone else who stumbles upon this article: I actually started out on bamboo flutes (the cheap ones available at renaissance fairs!) I then found Eric the Flutemaker. He produces a wide variety of bamboo flutes (based in Florida, I think) including ones that are concert tuned. They are the reason I became interested in the silver flute in the first place! :) Very good quality and some beautiful craftsmanship from the several I own. The web site is eriktheflutemaker.com. Even if it's purely recreational, I hope anyone who hasn't played bamboo gives it a shot. Great blog Jen! I'm SO SO glad the masking tape caper works for your show!